I have a confession to make. Until this year I hadn’t made Thai green curry for about 2.5 years. Crazy right? 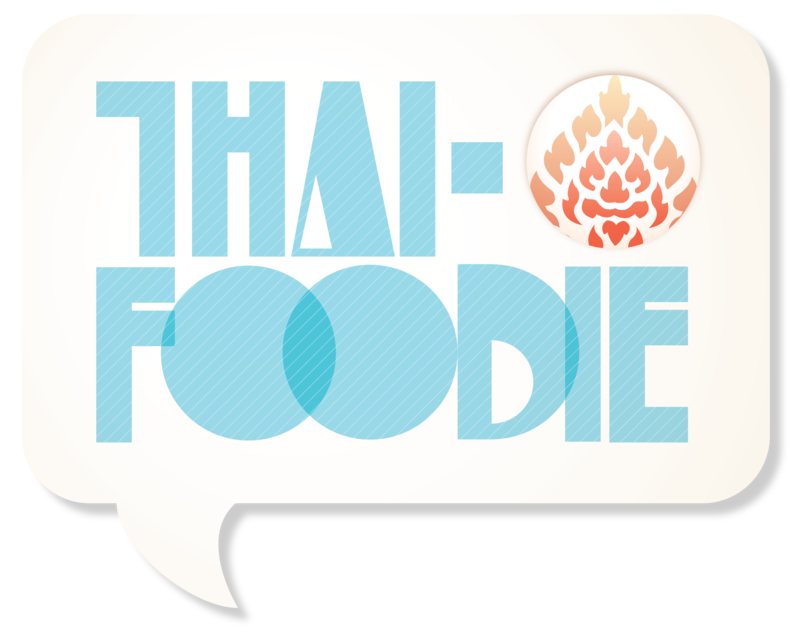 You would think someone who loves cooking Thai food would cook it at least once a month. But even though many Americans and Thais adore green curry, including myself, my Thai husband doesn’t like it. He said he got sick of it. When he was a kiddo, he would walk down the dusty streets of Sukhothai and smell the green chili coconut perfume in the air, and it was intoxicating for awhile. But after years and years of eating it, smelling it and seeing it all over Thailand, it became dull to him. Why eat green curry when there were hundreds of Thai food vendors selling more interesting, exciting Thai food? I can’t relate. Before writing this blog post I was trying to think of a food I’ve gotten sick of because I’ve eaten it so much, and I can’t think of a single thing. I think it’s because I always try to change up whatever I eat before something I savor with every bite becomes something I crinkle my nose at. Well we finally ended our green curry fast when we were going to make Thai food for our friends who love green curry. After not eating it for so long, our tastebuds started to get excited on Thursday and the dinner wasn’t until Saturday. But when the night arrived to cook it for them, my friend’s husband had a canker sore, and she had a cold. They didn’t want the spicy food to scar their already tender mouths and throats, so we decided to play it safe and make something non-spicy. I had already bought the fresh Thai eggplant and basil though, so that meant it we had to make it soon, and it was going to be all for Dom and I. If you are wondering which green curry paste to use, it’s up to you. I bought a small can of Maesri since we don’t eat tons of it, but the huge Mae Ploy containers are fine too. But I told Dom what I want for Christmas is a stone mortar and pestle, so I can make my own green curry paste. I have a wooden mortar and pestle, but it just doesn’t have the power I need to smash up my chilis and herbs into tasty oblivion. He thinks it’s really weird I want to make my own green curry paste when I can buy it easily at the Asian market. Most Thais don’t even make their own, but I know fresh curry paste doesn’t even taste like it came from the same planet as the canned or bottled stuff. And canned and bottled curry paste is delicious too! So imagine what I could do with my very own stone mortar and pestle dear hubby…perhaps make you fall in love with Thai green curry like never before. Are you like Dom? What food have you gotten sick of after eating it so much? Help me relate! 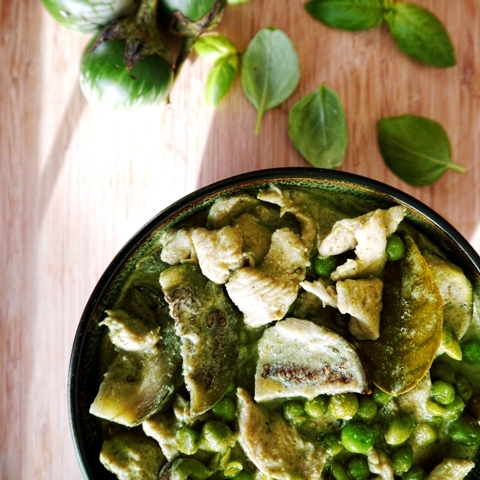 Love eating Thai green curry at your favorite Thai restaurant? 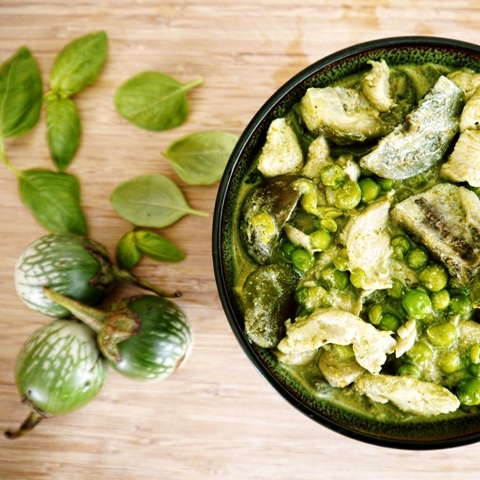 Try making it at home with this easy Thai Green Curry recipe! It's easier, cheaper and better than eating it out! Add cooking oil to large pot and warm it. Be careful not to shake up your coconut milk because you want the thick cream to stay on top. Spoon out the thick cream from each can into the large pot and heat over medium-heat. Reduce until it looks bubbly like melted marshmallows. Add curry paste to the coconut cream and fry for a few minutes until its fragrance soothes your soul and makes you smile. Add the rest of the milk, and water to the coconut cream and curry paste, and bring to a boil. Add the meat and pea eggplants to the pot, if you somehow found them (I never have). If using fresh or frozen peas, don't add them yet or they will disintegrate, lesson learned. Reduce heat and simmer 10 minutes uncovered. After simmering, add the Thai eggplants, frozen or fresh peas (if using) and kaffir lime leaves to the pot. Taste the curry. If you think it needs more salt, add fish sauce to taste. I like to add palm sugar because I like my curry a bit sweeter since coconut milk lends itself to that. Simmer a few more minutes until the eggplants and peas are tender. Stir in the basil and cook one more minute and turn off the heat. I think curries always taste better the next day because all the herbs got to mingle and get to know each other over night. If I'm having guests over, I like to make green curry the night before and warm it up before they arrive. This recipe is adapted from Kasma Loha-Unchit's wonderful cookbook, "It Rains Fishes." Hey girl! Do you think I’d be able to find the curry paste at HEB or is there an asian store shopping trip added to my day? Recipe looks great! Can’t wait to taste it! They usually do have Thai green curry paste at HEB in the International Foods aisle! But if not, you can also of course find it at the Asian Market. I love going to MT Supermarket on N. Lamar! Can’t wait to hear how yours goes! In step 3, when you say “fry” the curry paste and coconut milk (cream), are you heating oil in a pan and then adding the 2 ingredients into it? Correct Steve! I will clarify that in my recipe! Thanks for the great question! Every time I see this it makes my mouth water, so I’m finally going to try it out this week! Can’t wait 😀 I’ll definitely upload my cooksnap after I make it! We made this tonight, I had been craving curry for a while. We did it with tofu instead of the chicken and it was delicious! Thanks! I’m so glad you enjoyed it Blake and Bekah! I love it with tofu too! Good choice! in step 5 am I adding this to the frying pan or the big pot?